With the goal of being a zero emissions brewery, North Brewing Company has been brewing Belgian inspired beers for the past couple of years. Located in the North End of Halifax, NS they have become a local favourite. I first visited them when they had only just opened and where know at the time as Bridge Brewing, they have continued to mature and expand their offering since. From the brewery: Our French Farmhouse-inspired ale. Candied fruit aroma. A solid malt character balanced out with a refreshing tartness from the yeast. Big and complex. Appearance: Deep ruby red with amber highlights. Beautiful carbonation with a slight head. Aroma: Malt with plums and a dark cherry note. A bit of barnyard, earthy funk. My mouth is watering already. Taste: Lots of fruit – cherries and raspberries. Some of the funk comes through giving a full flavour and balancing the beer. Nice malt presence. There’s a slight tartness that really fills things out. With a lot going on, nothing is overwhelming. Mouthfeel: Though this is a dry beer and the body is thin as expected, there’s the illusion that it’s fuller then it is. Perfect carbonation. Overall: Very well done. Nothing seems out of place and all the elements are working in perfect harmony. As it opens up in the glass it melds together making a wonderfully tasty experience that dances across the palate. 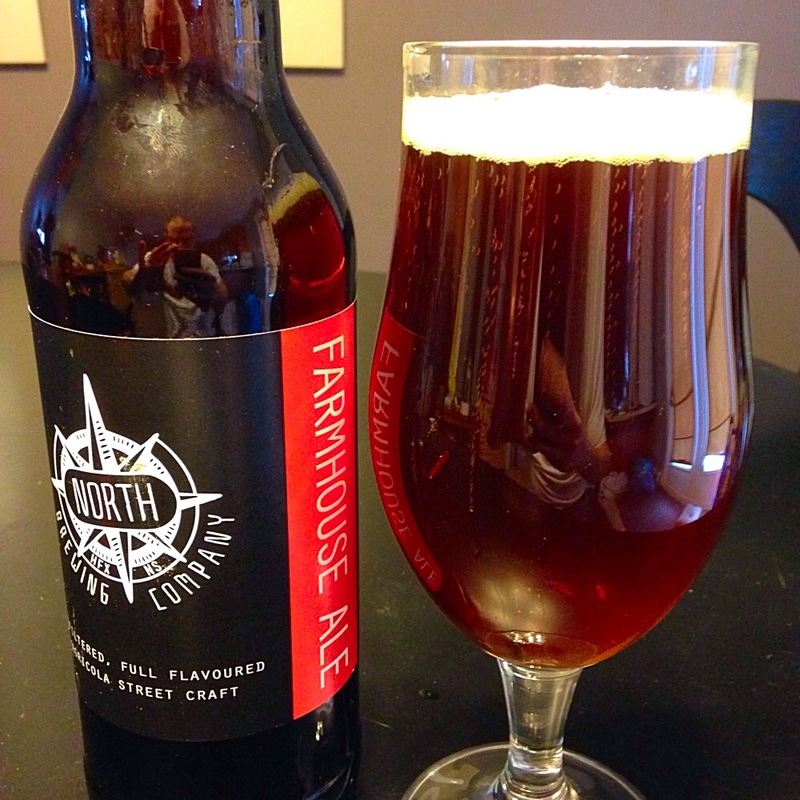 You can find North Brewing Co. on the web, Facebook, and Twitter. I picked up this offering from Picaroons (Fredericton, New Brunswick) at RockHead Wine & Beer Market in Halifax and it was a surprise in every way. Based on the name, I assumed it was a wee heavy, so the first surprise came when I realized it was a gruit. I’d never had the style before, and after Googling it, I was skeptical: it’s an ancient style of unhopped ale, using heather tips and flowers. With that in mind, I cracked open the bottle fully prepared to hate it. From the brewery: Plaid to the Bone Heather Ale is a 4.5% abv ale made with heather tips and flowers created especially for the upcoming New Brunswick Highland Games Festival. Appearance: Hazy and golden, with a thin pearly head. Minimal lacing. Aroma: A big nose of wild flower and…sweaty feet. Seriously: there’s a dank, mushroomy, sweaty funk there—like damp tennis shoes on a hot summer day. Taste: To my manifest relief, the funky qualities don’t continue into the taste. There’s a little bit of mushroominess, but it’s mostly clean and faintly sweet, with a slightly floral finish. Mouthfeel: Light and easy drinking, ideal for a hot summer day. Overall: As this is the first and only gruit I’ve ever tasted, I can’t really say how it represents its style, but it stands on its own as a unique and pleasantly surprising beer. You can find Picaroons on Facebook, and Twitter. I’ve been hearing American friends talk about Rogue’s (Newport, Oregon) signature IPA for ages, so I was pretty excited when I recently found it at RockHead Wine & Beer Market in Halifax. My favourite beer style is a big ballsy IPA, and I was curious to see if this one measured up to its hype. From the brewery: Brutal combines Oregon hops with English Malts. The Oregon grown Crystal hop is a triploid variety developed from the German Hallertau aroma hop variety with contributions from Cascade, Brewers Gold, and Early Green. Crystal is the only hop used in brewing Brutal and it provides a massive amount of aroma without dry-hopping. The English malts used are floor malted Pipkin (a mellow cross of Maris Otter and Warboys, from an English company called Beeston), Cara Vienna and Cara Wheat. Appearance: Cloudy orange pour with a rich and persistent white head. Strong and lingering lacing. Aroma: Huge nose of lemon zest and fresh-cut pine. Taste: Cream-of-wheat sweetness up front, with a sharp lemon-zest finish. Long-lingering bitterness. Mouthfeel: Big carbonation means a tingly, lively mouthfeel, with a bit of tongue-curling from the aftertaste. Overall: This IPA’s reputation is well earned. It’s nicely crafted, aggressively hoppy but not overwhelming, and expertly balanced. Add this one to your Essential American Craft Beers list. You can find Rogue Ales on the web, and Twitter. I picked up this American stout from Brasserie Dieu du Ciel (St-Jérôme, Quebec) at Bishop’s Cellar in Halifax in December, and actually managed to save it for a couple of months before I sampled (which is something of a record for me). Generally, I don’t get too excited about stouts (I’m more of an IPA or amber guy) but I’ve had enough good Dieu du Ciel beers to know that any style from them is a safe choice. From the brewery: Black ale with aromas and flavours of vanilla, dark chocolate, bourbon and roasted malt. The vanilla and cocoa marry nicely, without out-competing each other, to produce a surprisingly well balanced beer. This beer is mildly hoppy, but the cocoa introduces a touch of bitterness. Its colour may be intimidating, but it is a very smooth beer within reach of most beer drinkers. This highly appreciated dessert beer is brewed with organic fair-trade cocoa and first rate vanilla beans. Appearance: Black as coffee in the glass, with lively carbonation and a slight off-white head. Stubborn lacing. Aroma: Big roasty nose of vanilla bean, dark chocolate and creamy malt. Taste: The taste delivers what the aromas promised. This is a beautiful, rich stout—tastes like fresh baked brownies with creamy dark chocolate icing. Just a hint of roasted malt. Sweet without being cloying; elegantly balanced. Mouthfeel: Smooth and creamy, slight bitterness on the tongue to cut through the sweetness. Medium body. Overall: Holy smokes. This is the best stout I’ve ever tasted.There are so many sweet, tantalizing flavours going on, all in well balanced harmony. After reading my enthusiastic notes a few days after tasting, I decided to sample another bottle, thinking I might dial my praise back a bit. I ended up raising the score. It’s sweet and tasty, but so well crafted that you could drink it all night. Dieu du Ciel is one of Canada’s best breweries, and this is one of its best beers. It’s a must-try. You can find Brasserie Dieu du Ciel on the web, Facebook, and Twitter. 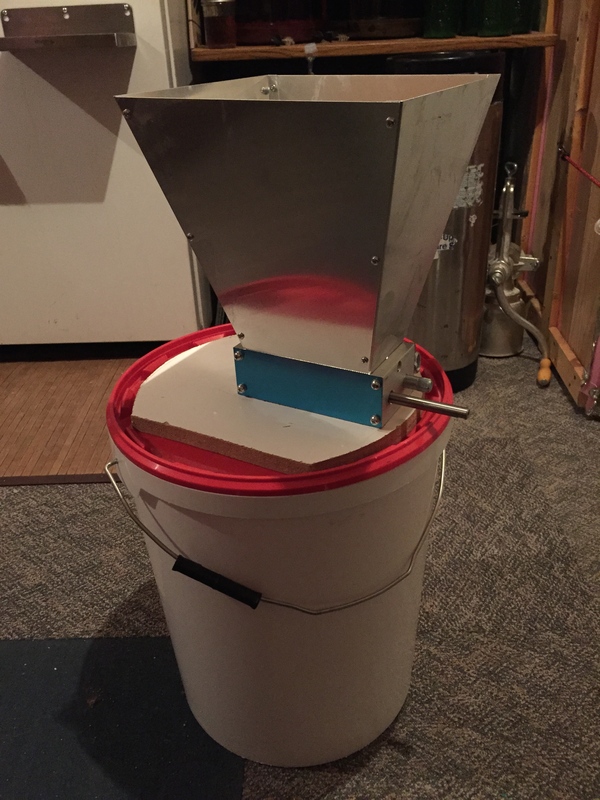 Like us on Facebook, follow us on Twitter and Instagram, and be our friend on Untappd. .
Got my new grain mill from Everwood Avenue Brew Shop. Here’s a quick video of me putting it together (super easy). Pretty nice mill at a really good price. I’ve since attached it to a bucket lid so it now a self contained milling system – great for dust control.